A look at the game and its components. 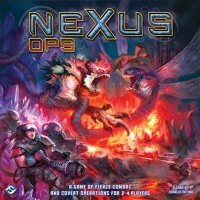 Nexus Ops is a board game of fierce sci-fi battles and fantastic alien creatures in which two to four players control factions of corporate troops and strange life forms on an alien moon. Players deploy troops from their home base to explore the landscape, mine resources, purchase troops, win battles, and fulfill missions, all in an attempt to gather enough power to claim the moon for themselves. This new edition of this classic title features detailed plastic figures, stunning new art, a clarified rulebook, and a host of optional rules and variants. Race to the monolith in King of the Hill mode, face the peril of the deadly Vortex, or introduce a full set of alternate unit powers! My first play-through of Nexus Ops was a fairly interesting experience. There are two main “phases” of the game which begin/end basically whenever. Each turn, players get to move units, explore hexes with unexplored tokens, battle in contested hexes, mine for resources, and draw a secret mission card. 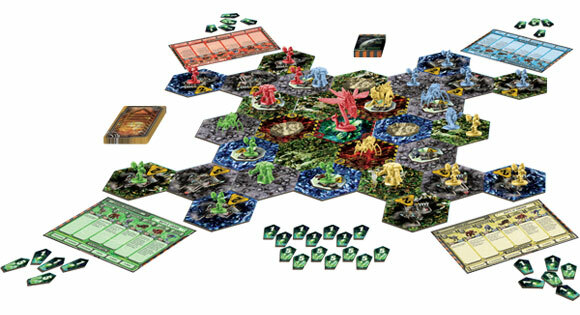 In the beginning, players fan out across the board, attempting to gain control of various hexes in order to uncover and maintain rubium deposits. At the end of each player’s round, any hex controlled solely by the player with a rubium refinery on it earns the player that amount of rubium to be used for purchasing units. Humans may not move into lava pits, and humans, fungoids, and crystallines may not move into the Monolith. The three cheapest units are the only units considered “mining” units, so if a refinery is held but does not contain a mining unit, rubium may not be collected from that hex. Units have various and attack values and abilities. Units attack based on a X+ roll of the dice. So for example, the human characters (cheapest and weakest of units) hit at a 6+ on a die. In contrast, the mighty rubium dragon attacks at a 2+. In other words, the only way a human hits is by rolling a 6, and the only way a dragon misses is by rolling a 1. Units’ attacks can sometimes be affected by the hexes in which they battle. For example, Fungoids usually roll at 5+ to hit but in a Liquifungus Forest they roll at 4+ and in a Crystalline plane they attack at a 6+ roll. Winning a battle earns players a battle victory point. Secret mission cards can also earn players victory points. Secret mission cards give a player points for winning combat with various units, holding more of a type of hex than other players, defeating a certain type of unit in combat, etc. The game ends when a player accumulates 12 or more victory points or any player is eliminated from the game. I had a great time playing this game. I am into the science fiction genre and learning all the abilities each unit has was great fun. One thing I really liked was the luck factor involved in the game. For example, I defeated a rubium dragon with a human because of an extremely unlucky roll by another player and an extremely lucky roll by myself. I like how the game can turn around like that. I gave the Replay Value a 4 because I would personally love to play it again and because I have seen several of my friends play it over and over. I gave the Components a 5 because the art on the hexes, tokens, and cards is beautiful and because the units are probably the most detailed I have ever seen in a boardgame. I gave the Easy to Learn a 4 as well, as it took us about five minutes to learn how to play the game. If you’re looking for a well designed war strategy board game, then look no further. Nexus Ops easily tops my list of board games to play with friends. In Nexus Ops you play as competing factions on an alien planet rich in rubium, the currency of the game. Players compete to control rubium refineries to collect money to train units for their disposal. The competition can be fierce as the map is limited in size. The unit you can buy vary from the cheap lowly Human Miners to the costly ferocious Rubium Dragons! 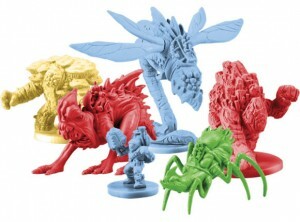 The models for the units are beautifully detailed and really add to the experience (as per the 2012 reprint). The object of the game is to collect 12 or more victory points. Victory points are awarded when you win battles by completely wiping out the opposing army in a contested hex. I really like this game mechanic because it encourages aggression and quick kills. You only get victory points if you win battles during YOUR turn. You can’t sit back and turtle, waiting for others to attack you. You can also get victory points by completing Secret Mission cards which you pick up at the end of your turn. Secret Missions award you victory points based on risk and difficulty. The harder the mission, the greater the reward! As long as you successfully fulfill the conditions described on the Secret Mission card during your turn, you get the victory points. This element introduces some luck with drawing random mission cards, but it also balances it out with varying difficulties to the missions. You are more likely to collect easier missions than the difficult, high reward ones. I’ve owned Nexus Ops for two years and played it several times. I still get very excited whenever we play! Definitely has a lot of replay value! The mechanics are very well balanced and the rule book is easy to read thanks to its diagrams and clear descriptions. If you want to see pictures and learn more, check out my other reviews for Nexus Ops! Add a Review for "Nexus Ops"